I have always felt that everyone, including DFIR analysts, need to take some level of responsibility for their own professional education. What does this mean? There are a couple of ways to go about this in any industry; professional reading, attending training courses, engaging with others within the community, etc. Very often, it's beneficial to engaging in more than one manner, particularly as people tend to take in information and learn new skills in different ways. Specifically with respect to DFIR, there are training courses available that you can attend, and it doesn't take a great deal of effort to find many of these courses. You attend the training, sit in a classroom, listen to lecture and run through lab exercises. All of this is great, and a great way to learn something that is perhaps completely new to you, or simply a new way of performing a task. But what happens beyond that? What happens beyond what's presented, beyond the classroom? Do analysts take responsibility for their education, incorporating what they learned into their day-to-day job and then going beyond what's presented in a formal setting? Do they explore new data sources, tools, and processes? Or do they sign up again for the course the following year in order to get new information? When I was on the IBM ISS ERS team, we had a team member tell us that they could only learn something if they were sitting in a classroom, and someone was teaching them the subject. On the surface, we were like, "wait...what?" After all, do you really want an employee and a fellow team member who states that they can't learn anything new without being taught, in a classroom? However, if you look beyond the visceral surface reaction to that statement, what they were saying was, they have too much going on operationally to take the time out to start from square 1 to learn something. The business model behind their position requires them to be as billable as possible, which ends up meaning that out of their business day, they don't have a great deal of time available for things like non-billable professional development. Taking them out of operational rotation, and putting them in a classroom environment where they weren't responsible for analysis, reporting, submitting travel claims, sending updates, and other billable commitments, would give them the opportunity to learn something new. But what was important, following the training, is what they did with it. Was that training away from the daily grind of analysis, expense reports and conference calls used as the basis for developing new skills, or was the end of the training the end of learning? 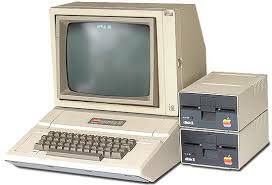 Back in 1982, I took a BASIC programming class on the Apple IIe, and the teacher's philosophy was to provide us with some basic (no pun intended) information, and then cut us loose to explore. Those of us in the class would try different things, some (most) of which didn't work, or didn't work as intended. If we found something that worked really well, we'd share it. If we found something that didn't work, or didn't work quite right, we'd share that, as well, and someone would usually be able to figure out why we weren't seeing what we expected to see. Jump ahead about 13 years, and my linear algebra professor during my graduate studies had the same philosophy. Where most professors would give a project and the students would struggle for the rest of the week to "get" the core part of the project, this professor would provide us with the core bit of code (we were using MatLab) to the exercise or lab, and our "project" was to learn. Of course, some did the minimum and moved on, and others would really push the boundaries of the subject. I remember one such project were I spent a lot of time observing not just the effect of the code on different shaped matrices, but also the effect of running the output back into the code. So now, in my professional life, I still seek to learn new things, and employ what I learn in an exploratory manner. What happens when I do this new thing? Or, what happens if I take this one thing that I learned, and share it with someone else? When I learn something new, I like to try it out and see how to best employ it as part of my analysis process, even if it means changing what I do, rather than simply adding to it. As part of that, when someone mentions a tool, I don't wait for them to explain every possible use of the tool to me. After all, particularly if we're talking about the use of native Windows tool, I can very often go look for myself. If you're interested in trying your skills out on some available data, Mari recently shared this MindMap of forensic challenges with me. This one resource provides links to all sorts of challenges, and scenarios with data available for analysts to test their skills, try out new tools, or simply dust off some old techniques. The available data covers disk, memory, pcap analysis, and more. This means that if an analyst wants to learn more about a tool or process, there is data available that they can use to develop their knowledge base, and add to their skillz. So, if someone talks about a tool or process, there's nothing to stop you from taking responsibility for your own education, downloading the data and employing the tool/process on your own. 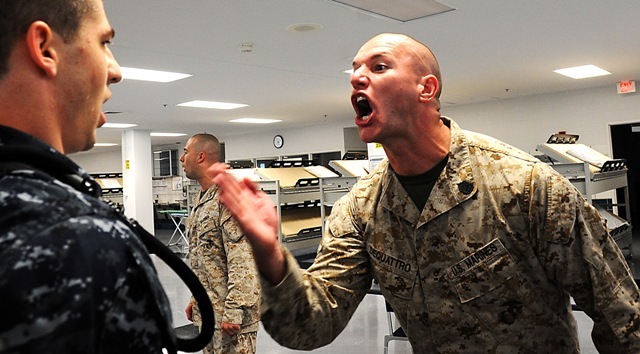 When I was a 2ndLt, I learned that one of my responsibilities as a platoon commander was to ensure that my Marines were properly trained, and I learned that there were two aspects to that. The first was to ensure that they received the necessary training, be it formal, schoolhouse instruction, via an MCI correspondence course, or some other method. The second was to ensure that once trained, the Marine employed the training. After all, what good is it to send someone off to learn something new, only to have them return to the operational cycle and simply go back to what they were doing before they left? I mean, you could have achieved the same thing by letting them go on vacation for a week, and saved yourself the money spent on the training, right? Now, admittedly, the military is great about training you to do something, and then ensuring that you then have opportunity to employ that new skill. In the private sector, particularly with DFIR training, things are often...not that way. So, the point of all this is simple...for me, learning is a matter of doing. I'm sure that this is the case for others, as well. Someone can point to a tool or process, and give general thoughts on how it can be used, or even provide examples of how they've used it. However, for me to really learn more about the topic, I need to actually do something. The exception to this is understanding the decision to use the tool or process. For example, what led an analyst to decide to run, say, plaso against an image, rather than extract specific data sources, in order to create and analyze a timeline while running an AV scan? What leads an analyst to decide to use a specific process or to look at specific data sources, while not looking at others? That's something that you can only get by engaging with someone and asking questions...but asking those questions is also taking responsibility for your own education. Documented by Microsoft in 2014, Ramdo continues to evolve to evade host-based and network-based detection. I thought, hold on a second...if this was documented in April 2014 (2 yrs ago), what about it makes host-based detection so difficult? I decided to take a look at what some of the AV sites were saying about the malware. After all, the MSRT link indicates that the malware writes it's configuration information to a couple of Registry values, and the Win32/Ramdo.A write-up provides even more information along these lines. I updated the RegRipper malware.pl plugin with checks for the various values identified by several sources, but because I have limited data for testing, I don't feel comfortable that this new version of the plugin is ready for release. Speaking of RegRipper plugins, just a reminder that the newly published Windows Registry Forensics 2e not only includes descriptions of a number of current plugins, but also includes an entire chapter devoted just to RegRipper, covering topics such as how to use it, and how to write your own plugins. The book also covers, starting on page 53 (of the softcover edition), tools that I use to incorporate Registry information into timeline analysis. I've used to this methodology to considerable effect over the years, including very recently to locate a novel WMI persistence technique, which another analyst was able to completely unravel. For those who may not be aware, mimikatz includes the capability to clear the Event Log, as well as reportedly stop the Event Service from generating new events. Okay, so someone can apparently stop the Windows Event Log service from generating event records, and then steal your credentials. If nothing else, this really illustrates the need for process creation monitoring on endpoints. Addendum, 14 Apr: I did some testing last night, and found that when using the mimikatz functionality to clear the Windows Event Log, a Microsoft-Windows-EventLog/1102 event is generated. Unfortunately, when I tried the "event::drop" functionality, I got an error. Something else to keep in mind is that this isn't the only way that adversaries can be observed interacting with the Windows Event Log. Not only are native tools (wevtutil.exe, PowerShell, WMI) available, but MS provides LogParser for free. The folks at Carbon Black recently posted an article regarding the use of Powershell in attacks. As I read through the article, I wasn't abundantly clear on what was meant by the adversary attempting to "cloak" attacks by using PowerShell, but due in part to the statistics shared in the article, it does give a view into how PowerShell is being used in some environments. I'm going to guess that because many organizations still aren't using any sort of process creation monitoring, nor are many logging the use of Powershell, this is how the use of Powershell would be considered "cloaked". Be sure to take a look at the United Threat Research report described in the Cb article, as well. In case you missed it, the blog post titled, "A Novel WMI Persistence Implementation" was posted to the Dell SecureWorks web site recently. In short, this blog post presented the results of several SecureWorks team members working together and bringing technical expertise to bear in order to run an issue of an unusual persistence mechanism to ground. The specifics of the issue are covered thoroughly in the blog post. What was found was a novel WMI persistence mechanism that appeared to have been employed to avoid not just detection by those who administered the infected system, but also by forensic analysts. In short, the persistence mechanism used was a variation on what was discussed during a MIRCon 2014 presentation; you'll see what I mean you compare figure 1 from the blog post to slide 45 of the presentation. What this command does is go into the binary MOF file (binarymof.tmp), and attempt to extract the text that it was created from, essentially "decompiling" it, and placing that text into the file "recovered.mof". It was no accident that Matt was asking about this; here is Matt's BlackHat 2015 paper, and his presentation. Okay, the book is out! At last! 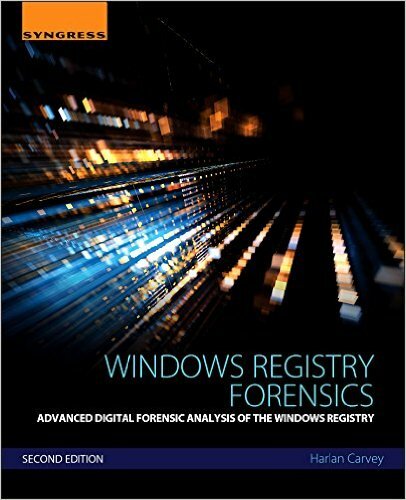 This is the second edition to Windows Registry Forensics, and this one comes with a good bit of new material. Chapter 1 lays out what I see as the core concepts of analysis, in general, as well as providing a foundational understanding of the Registry itself, from a binary perspective. I know that there are some who likely feel that they've seen all of this before, but I tend to use this information all the time. Chapter 2 is again about tools. I only cover available free and open-source tools that run on Windows systems, for the simple fact that I do not have access to the commercial tools. Some of the old tools are still applicable, there are new tools available, and some tools are now under license, and in some cases, the strict terms of the license prevent me from including them in the book. Hopefully, chapter 1 laid the foundation for analysts to be able to make educated decisions as to which tool(s) they prefer to use. Chapters 3 and 4 remain the same in their focus as with the first edition, but the content of the chapters has changed, and in a lot of aspects, been updated. Chapter 5 is my answer to anyone who has looked or is looking for a manual on how to use RegRipper. I get that most folks download the tool and run it as it, but for my own use, I do not use the GUI. At all. Ever. I use rip.exe from the command line, exclusively. But I also want folks to know that there are more targeted (and perhaps efficient) ways to use RegRipper to your advantage. I also include information regarding how you can write your own plugins, but as always, if you don't feel comfortable doing so, please consider reaching to me, as I'm more that happy to help with a plugin. It's pretty easy to write a plugin if you can (a) concisely describe what you're looking for, and (b) provide sample data. Now, I know folks are going to ask about specific content, and that usually comes as the question, "do you talk about Windows 10?" My response to that it to ask specifically what they're referring to, and very often, there's no response to that question. The purpose of this book is not to provide a list of all possible Registry keys and values of interest or value, for all possible investigations, and for all possible combinations of Windows versions and applications. That's simply not something that can be achieved. 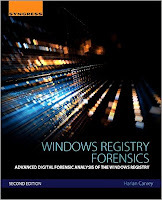 The purpose of this book is to provide an understanding of the value and context of the Windows Registry, that can be applied to a number of investigations. There's no doubt about it, writing a book is hard. For the most part, actually writing the book is easy, once you get started. Sometimes it's the "getting started" that can be hard. I find that I'll go through phases where I'll be writing furiously, and when I really need to stop (for sleep, life, etc. ), I'll take a few minutes to jot down some notes on where I wanted to go with a thought. While I have done this enough to find ways to make the process easier, there are still difficulties associated with writing a book. That's just the reality. It's easier now than it was the first time, and even the second time. I'm much better at the planning for writing a book, and can even provide advice to others on how to best go about it (and what to expect). At this point, after having written the books that I have, I have to say that the single hardest part of writing books is not getting feedback from the community. Take the first edition of Windows Registry Forensics, for example. I received questions such as, "...are you planning a second edition? ", and when I asked for input on what that second edition should cover, I didn't get a response. I think that from a 50,000 foot view, there's an expectation that things will be different in the next version of Windows, but the simple fact is that, when it comes to Registry forensics, the basic principles have remained the same through all available versions. Keys are still keys, deleted keys are still discovered the same way, values are still values, etc. From an application layer perspective, its inevitable that each new version of Windows would include something "new", with respect to the Registry. New keys, new values, etc. The same is true with new versions of applications, and that includes malware, as well. While the basic principles remain constant, stuff at the application layer changes, and it's very difficult to keep up without some sort of assistance. Writing a book like this would be significantly easier if those within the community were to provide feedback and input, rather than waiting for the book to be published, and ask, "...did you talk about X?" Even so, I hope that folks find the book useful, and that some who have received their copy of the book find the time to write a review. Thanks.